Perfect for wedding parties and family reunions. With sister property up to 20. Beautiful lake front access and view with four bedroom, three and a half bath, boat garage with lift and 2 separate jet ski ramps. 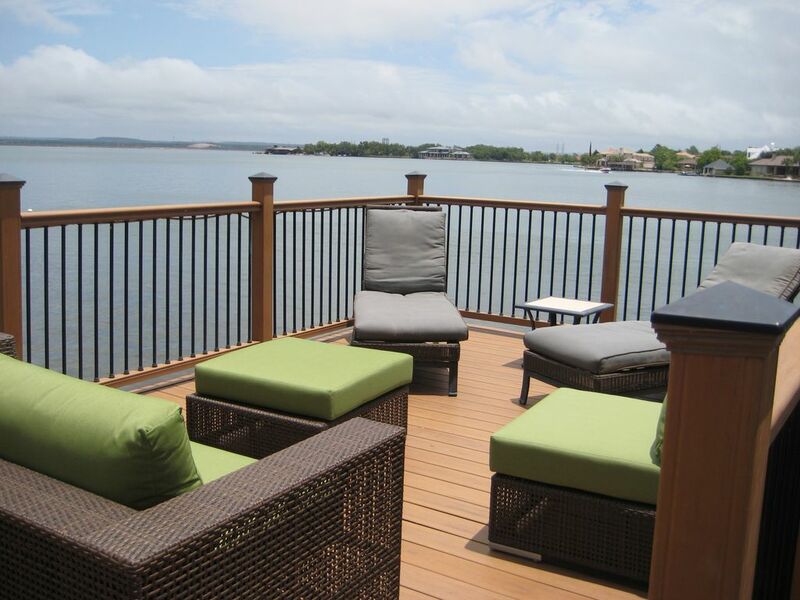 Spacious deck overlooking water with early afternoon shade. Seated dining for 10 inside and 8 outside. Fully furnished kitchen..
Three bedrooms upstairs: king master bedroom and bath, additional 2 queen bedrooms, which share full bath off hallway. Second floor living area readily accommodates entertaining with kitchen, family and dining areas opening to large, newly built upper deck. On the second level there is an outside stairway to the water. Additional lower level entrance to boat garage and jet ski ramp. Lower level contains washer and dryer, full bath and a second master bedroom with a king bed.. This condo is kid-friendly, but please keep in mind we are on the water. Excellent location for wedding guests, as it is less than 3 minutes to Horseshoe Bay and Marriot Resort. Ideal accommodations for family reunions especially with sister condo in same complex. We purchased this unit when our children were teens seeking a safe lake and in particular this cove for their growing independence on the water boating with friends. It has not disappointed. Over the years they eagerly return with their friends to continue to build memories of lakeside fun. Nicely appointed but family friendly furnishing encourage family and friend gatherings. Horseshoe Bay is close to Austin but is a great getaway from the city life. Located only 55 minutes from downtown and the airport it is a very convenient location for out of town guests as well as those who need to run into Austin to continue business from time to time while vacationing. Lake LBJ is constant level lake, therefore we always have water sports available. Also we have morning sun and afternoon shade, it makes for a very comfortable happy hour. For those who have the option, the Horseshoe Bay Resort is a quick walk or drive with breathtaking amenities. Located on a wide but calm, large cove of Lake LBJ. Within walking distance to Horseshoe Bay Resort -with gorgeous pool/waterside activities, tennis courts and golf course. Unit has room for two cars in driveway with additional shared parking for all units. Available for rent from owner. Two man and single kayak. Nice house with beautiful views! This house had everything we needed! Slept 8 comfortably. Was well stocked with all the supplies we needed. Was clean and had lots of seating for 2 families - inside and on the deck. And had beautiful views right on the lake. Plus, there’s a Wal Mart in town so you can buy all your groceries. Our families had a great time and we’d definitely stay here again. This is a fantastic condo right on the lake. The view from the kitchen, living room, and master bedroom is breathtaking. The entire condo is very spacious with four nice sized bedrooms. The master bedroom/ bath and the downstairs bedroom/bath are huge. The kitchen is very well stocked and roomy enough for several cooks to work at the same time. If needed, there is also a washer and dryer. We loved our time, and we plan to return sometime in the summer to enjoy the lake. The place was spacious, as each room is a good size with a queen or king sized bed (no bunks-woohoo!). The kitchen was stocked with dishes and silverware, but lacking in any of the extras (zip locks, trash bags, paper towels, etc)...no big deal, just make sure you bring your own! The grill was missing a piece so we weren't able to use it the first night, but maintenance came and fixed it the next morning. The deck was an awesome place to relax and eat! Make sure you ask permission to use anything extra (floats, kayak, etc), as we used a big float that we found in the garage and were nearly charged for it. After I communicated that there was no indication that the float was off limits, the owner ended up dropping the $50 charge. The owner also sent me a text halfway through the weekend telling me that he rents out the kayak for $150, and we all thought that was kind of over the top. You can rent a kayak on Town Lake for $20. Most places we've stayed in usually allow you to use their supplies so long as you take care of them. Just something to consider. Over all, we enjoyed our stay and loved that the condo was able to accommodate us and our furry friends. Great place for a getaway with family! The owner Duane worked well with us and allowed us to check in early since the unit was not rented out the night before. The condo is well cared for and clean. Gas grill was nice and clean also. A/C units worked well. We used the boat dock for our 21' boat however you have to be very careful when docking as it is pretty tight since the owner installed a pool type stair ladder on the side of the dock and the adjacent condo installed a set of metal stairs that go into the water at the end of their dock. The pool type stair ladder was convenient for getting into and out of the lake though. There is enough parking if you have a Jeep Cherokee sized SUV as it will fit into the garage and then park two cars/trucks in tandem in front of the garage. There are also a few over flow parking spots but it can get a bit tight. If you bring a boat you will need to keep the trailer off the property however you can pay for overnight trailer/truck parking at the nearby Lake LBJ Yacht Club at $15 plus tax per night and that includes the launch fees. Beautiful setting, Great location and well furnished and updated place. The property was just as described. The kitchen was well furnished, the living space was spacious and the beds were very comfortable. We had a lot of space and definitely enjoyed the waterfront and evenings on the patio. We look forward to coming back again. Duane and his property manager, Jim were great to work with and very accommodating. Holiday weekends 3 night minimum.